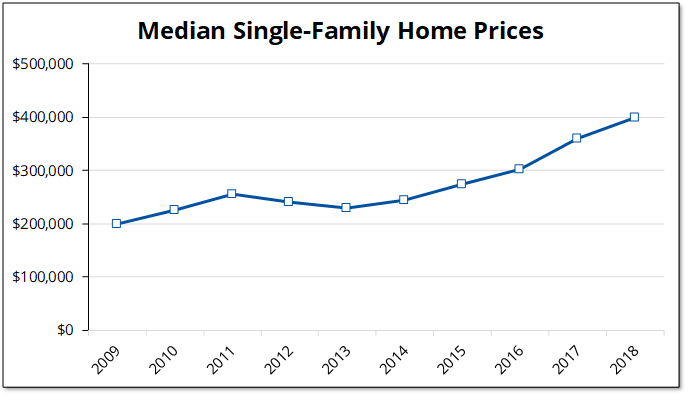 If the median price for a single-family home in the County doubled between 2009 and 2018 (which they did), does that mean my house doubled in value? Answer: maybe. First, a few definitions. Most of us are familiar with the term average (or technically, the arithmetic mean). When applied to house prices, the average would be the total of the prices of all homes sold divided by the number of homes sold. While widely used, the average is heavily influenced by extreme values. If most homes sold for about $300,000 one year, but there was one house which sold for $1 million, the million dollar home would have a big impact on the average. To avoid the impact of extreme values, the median is often used instead when measuring things like home prices. The median house price is the middle house price, with half of homes selling for less and half selling for more. Either way, it’s clear that the median price paid for single-family homes doubled from 2009 to 2018, but this does not necessarily mean that the value of your house doubled during that time period. The median price reflects real increase (appreciation) or decrease (depreciation) in home values, but that’s not all. The median price can also reflect the value of improvements in homes. If house prices remained steady, but you put in a new kitchen, the value of your home might increase, but not because homes overall had increased in price. The median price can also change if there’s a change in the product mix. If consumer tastes change and people start to buy big SUV’s instead of small economy cars, the median price for vehicles sold will go up even it there’s been no change in price for the different types of vehicles. All of this illustrates that it’s important to look beyond the headlines and to think about what might be actually going on when reading news about home prices.